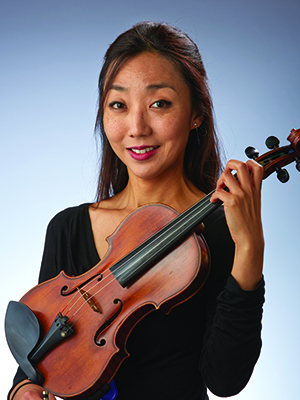 Violinist Jayna Park joined the Indianapolis Symphony Orchestra in 2001. In 2013, she was acting Assistant Concertmaster for the ISO and joined the Grant Park Music Festival Orchestra in 2015. Born in South Korea, she began her violin studies at the age of 6 and by age 7, Jayna won a concerto competition in Daegu, Korea which led to her orchestra solo debut with Daegu Philharmonic that same year. Since then she has won numerous competitions both in Korea and in the USA where she came to study violin at age 11 with the renowned violinist Berl Senofsky at the Peabody Conservatory. Jayna has won first prizes in the Korean Times National Competition, American String Teachers Association National Competition, Fischoff Chamber Music Competition, and the Philadelphia Concerto Soloists Young Artist Competition taking the Grand Prize. She was a finalist at the International Music Competition of Japan and a semifinalist at the Yehudi Menuhin Violin Competition in England. That same year in New York, Jayna won the Manhattan School of Music Concerto Competition leading to a solo engagement with the Manhattan Chamber Sinfonia conducted by Marin Alsop.